This article is written to inform the reader about a feature of life in the town over 100 years ago, and also to ask for help. I have been a member of Barton Wheelers since 1984, when it was still called Barton and District Wheelers, and have always believed that it was founded in the 1930s. While working recently on my previously reported Elswick-Hopper research at Scunthorpe Central Library, I discovered that the club was founded much earlier than that. There is a wonderful source of local history on the top floor of the library, where microfilm copies are kept of the Lincolnshire Star and the Stamford Mercury newspapers. The library staff are extremely helpful but be warned that it is quite a tedious task to trawl through just a single year, and there is a natural tendency to get sidetracked! I had already established that the first commercial bicycle was made in Barton, by Hopper, in 1890 and that it was a cross frame model called the Ajax. While searching through the Star of 1891 I found an unavoidable sidetrack with the mention of not one, but two Barton cycling clubs: In the issue dated 17th January 1891 there was a report of a meeting, held the previous Wednesday night at the White Swan, of the ‘Barton Wheelers C ycling Club’. Chaired by none other than Mr F Hopper, the purpose was to arrange the runs for the coming season; the first run was to be on 27th March to Brocklesby. Later in the year is a report of a run to Winterton to meet up with the Scunthorpe and Ashby Clubs for a race meeting (presumably at the grass track on the Showground?). ‘Much interest was taken in the Bicycle Handicap by the Bartonians, seeing that all the heats were won by Mr Hopper’s celebrated Ajax machines.’ Then, in the edition dated 14th March is a report of an AGM held in Mr Hopper’s showroom (on Brigg Road adjacent to John Keal’s shop), of the Barton and District Cycling Club, chaired by Rev. Charles Moor. The club Captain at that time was H W Ball, the notable Barton printer and historian. A report from October 1891 is of the annual Lantern Parade of the Barton and District and the Barton Wheelers Cycling Clubs, reminiscent of the now nationally famous Barton Bike Night. (OK, so no engines, but the motorcycle hadn’t been invented then!). A parade of 47 brilliantly illuminated machines met at Brigg Road and made their way through the town. They included a quadri-cycle and several ‘good old ordinaries’. It attracted ‘thousands’ of spectators and raised £3 for the provision of a dinner for the ‘men who work on the roads’, with any surplus to be given to the Barton Nursing Association. In those days the roads were poorly surfaced – probably crushed chalk, and bike tyres were solid – Mr Dunlop’s pneumatic tyres were not generally available for another 5 or 6 years, and the road mender was the cyclist’s indispensable friend. So, from a day’s research into Mr Hopper’s business, I discovered that Barton supported not one but two cycling clubs, and I also found mention of one at Barrow. The reported meeting at the White Swan also explained the origin of a photographic print I bought just this year from the David Lee/Dr Ball collection. 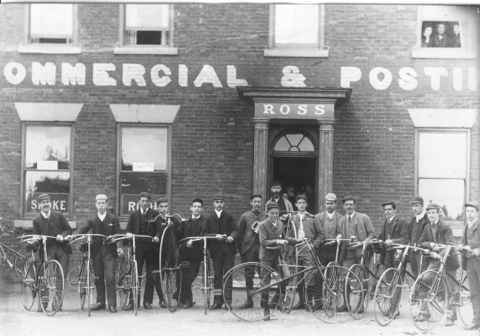 This shows several riders with cross frame bicycles, clearly ready for a club run. What is more, the man 6th from the right is Mr Fred Hopper. Now, can anyone identify the rest of the group or provide any information about either club? Old medals, logbooks, diaries and photographs are just some possible sources of information that would help to throw light on the early days of Barton’s cycling heritage. If you can help please contact me on 01652 633363 or email ndland@btinternet.com. Also, don’t forget that Barton Wheelers is still a very active club and is always looking for new members, especially young recruits, for club runs and racing. What better way to get, and keep fit, while maintaining a 114+ year tradition?